Fun yet traditional, this scarf will keep your little one (or you!) warm during the biggest breezes! 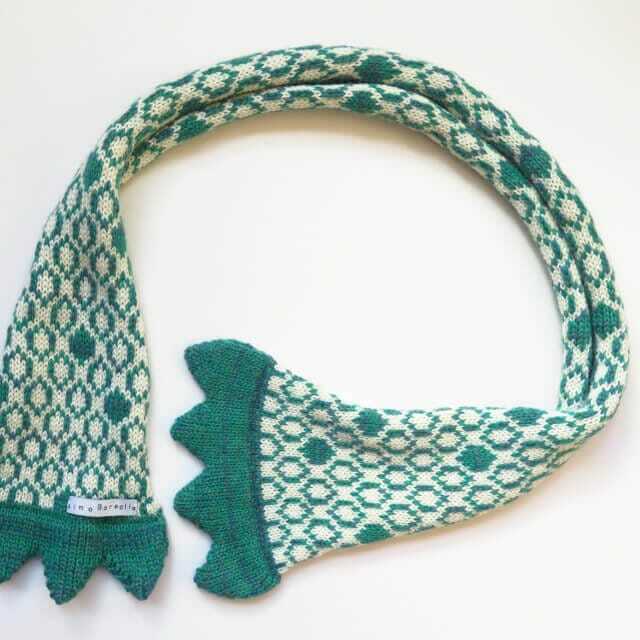 Fun yet traditional, this scarf will keep your little one (or you!) warm during the biggest breezes! Roly Poly Berry pattern goes with many outfits and what makes the scarf so special is the finishing touch at the ends of the scarf – trademark triangles of Alma Borealis! Then the story begins: ‘I went across the triangular hills to find the forest of berries…There were heaps of them; Green, Red and Blue, all waiting to jump in my mouth! I picked them and quickly ran home!’ It is those berries I want to wear. AlmaBorealis signifies 'Northern Soul' which Maija has. Maija was born in Finland to a family of knitters; the clickety-clack of needles knitting socks and mittens (the most consumed items in the Finnish winter wardrobe) was a constant companion whilst growing up. Maija knitted her first five needle mittens at the age of six, and crochet she began even earlier, at the age of five, having spent various holidays with her grandmother, watching her crochet endless (very grey...) coasters or table runners. Maija went to explore the world, found herself in London, worked in puppet theatres, studied costume construction for theatre and developed a career in Costume Design. Maija preferred working with children's theatre over all else and worked in the field as a costume designer, maker and milliner for a good ten years before making the move into the textile world. During her career in theatre, Maija often wondered, where, how and by whom the very affordable fabrics used in costumes were made? She decided to back to school, and study Textile Design. Maija graduated in 2016 with a BA(Hons), specialising in knitted textiles, and continued on to further her expertise in knitwear through a MA in Knitwear which currently satisfies Maija's academic curiosity whilst simultaneously designing for AlmaBorealis, her pride and joy. 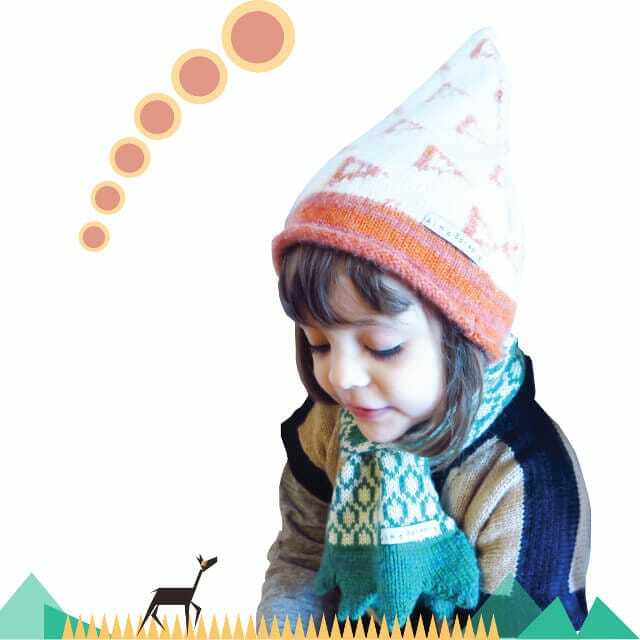 AlmaBorealis combines many of her passions, knitting, art, illustration and children's education. The experience in children's theatre echoes through Maija's work. Bold colours, interactive details that invite a child to dress up (it can sometimes be a challenge can't it!? ), sensory simulating tactile textures and imagination provoking features that charm both the child and the parent. Soft materials which make the child feel comfortable and safe. Ethical, sustainable and therefore local production is the core of Maija's designs. The yarns are sourced from the UK, at best, only 30 miles away from where they get knitted up, by Maija herself with a hand-operated knitting machine. Maija belives that a high quality product made with the best raw materials should and will last a long time. The products are designed to allow room for the child's growth so that they can be enjoyed for more adventures. Maija is a keen reader of children's books (with or without her little daughter!) and loves to create illustrations of magical creatures and locations where her knitwear turn into reality! Maija is intrigued by alternative educational philosophies such as Maria Montessori and often includes these elements in her designs. Child-centered education equals child-centered knitting!